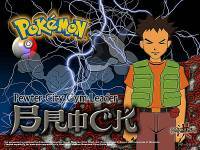 Doubtless, and fan of the anime knows about Brock, or Takeshi in the original version, is the girl crazy Rock Pokemon gym leader from Pewter City. He is a rather dark skinned boy of 14/15, always wearing that same green vest, brown pants, and bright orange Tee-shirt, with the optional pink frilly apron. He loves to cook, and joins up with Misty and Ash after his father returns, to form the infamous Twerp Trio! Brock is girl crazy, and will do ANYTHING to try and get a good looking girl to date him. His eyes..or what pass for eyes...baloon into hearts, and he begins to blush and drool. Then he’ll stammer and stutter, until he says something really stupid, and just stands there, leering at the poor woman. 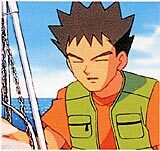 In the Orange Islands, Brock takes a vacation from his travels to stay and help Proffesor Ivy, a female Pokemon researching friend of Proffesor Oaks...who also happens to wear a very low cut shirt. But, our dear Brock comes back! After close to a season, Ash and Misty return with a Pokemon sketching Brock substitute, Tracey. Guess who they find at his mom’s place? BROCK! Apparently, Proffesor Ivy did SOMETHING, and Brock left, coming back to Ash’s mom’s house..cause, well, he thinks Ash’s mom is hot. Tracey stays behind with Oak, and Brock joins Misty and Ash as they head to the new Johto league. Brock is the leader of the first pokemon gym. Ash meets Brock while fighting in Brock's gym. Brock loves rock type pokemon. After Ash fights him they become pals. 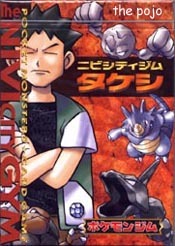 Brock is the Pewter city Gym Leader, the first gym in the Kanto League. After meeting Ash and subsequently losing to him, Brock joins Ash and Misty on their individual quests of glory. Later on, Brock decides to stay with Professor Ivy to help with the housekeeping. After Tracey decides to stay with Professor Oak, Brock rejoins his previous group as they enter the mysterious Johto League. Brock has a thing for girls. But, he gets shot down everytime =( but however, there was one gal named Wilhemina in the Pokemon episode “For Crying Out Loud” who liked Brock! They even hugged! But alas, they had to depart......sigh. As much as I like Brock, I am sad to say that he is kind of a weak trainer. His Onix got beaten by Team Rocket’s Meowth. Yeah, I know that Meowth cheated, but Onix is a BIG Pokemon, you know? Oh Tracey, how I hate you! The second season was the one I did not like very much, except for the theme song. The first season was good, second season was a bit blah, but a good theme song and the third season is great but with a blah theme song. The first theme song is okay, but you know, some people get tired of hearing the same theme song......oops a little bit off track this isn’t Brock!